NO FORWARD CHAIN - Crofts Estate Agents are delighted to market this three bedroom detached bungalow which is located in a popular residential area of Cleethorpes. Close to Middlethorpe Road shops and local schools, this property is in need of a refurbishment throughout but is set on a generous plot and benefits from having a garage and a large rear garden. Internally, the bungalows layout comprises of an entrance porch leading into the main hallway, front lounge, kitchen, bathroom with four piece suite and three bedrooms. The bungalow does benefit from recent uPVC double glazing throughout. Viewings are available immediately and is being offered with no forward chain. The entrance hallway is the centre room in the property in which all the rooms are found off this space. A long area which initially has a front porch area and as the hall gets down towards the kitchen and rear bedrooms it widens and opens up to create a larger hall space. The lounge is located to the front of the property and has a uPVC window to the front and also another window on the side of the room creating a bright dual aspect room. The room is a bright airy space which is a brilliant size making this the main room in the bungalow. The kitchen is located to the rear of the property and faces out onto the back garden. There are units along three walls which provide a good level of storage space and worktop space. Some works may need to be carried out to bring this room up to a modern standard. The family bathroom is located just off the main hallway and benefits from having a four piece suite installed. There is a bath, wash basin, toilet and separate shower unit. The first of the bedrooms is located to the front of the property and looks out onto the front garden. 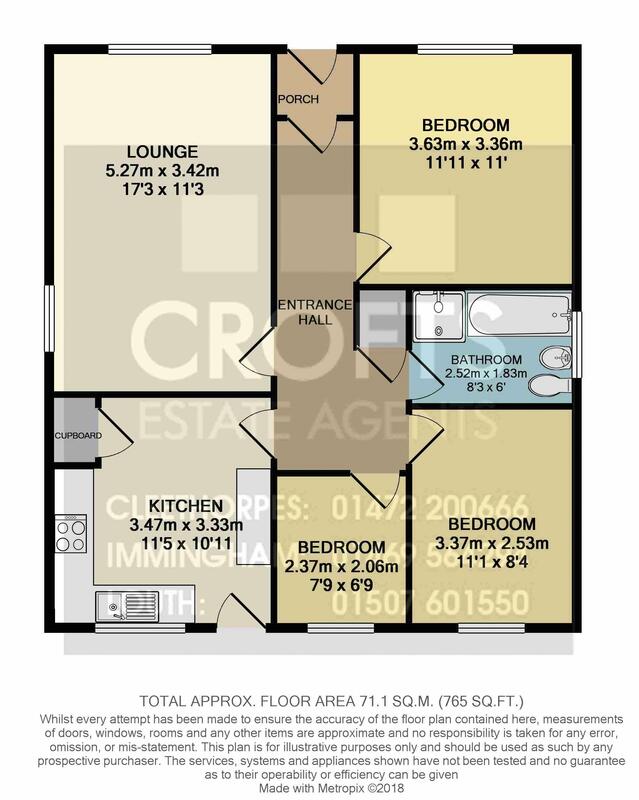 A double room in size, with a front uPVC window and fairly neutral decor. The second of the bedrooms is another double and faces out onto the back garden. This is a bright room which is neutral in decor and has a uPVC window. The third bedroom is the smallest of the three but it is still a generous size for a third room. Again, located to the rear of the bungalow, it faces out onto the back garden and is a nice bright room. The back garden is a brilliant sized space plus you will also find the detached garage located in this area. A patio runs along the rear of the bungalow and then a large section of lawn takes you to the back of the garden. A really nice outdoor space which has lots of potential. Established in 2005, Crofts has established itself as a leading independent estate agency specializing in Residential Sales, Lettings, New Home Sales, Commercial Property and Financial Services. Crofts Estate Agents LTD. Registered in England. Company No: 5624456. Registered Office Address: 66 St Peters Avenue, Cleethorpes, N. E. Lincs, DN35 8HP.